It’s been over a decade since Apple started including the utility DAW GarageBand on all of its computers, and we now live in an era when it’s natural for every musician to hit record on a computer and lay down a track, jam, or practice session. And of course, as computer technology has evolved and become more and more integrated with our lives, trends have moved away from standalone computer programs and toward apps and web–based social media. It would only be a matter of time before the music world caught up with these trends. In a very exciting turn, social media innovations have sprung up in the past few years to help people make and share music together. And no, we’re not talking about lip syncing on musical.ly. A spate of new apps is solving the age–old problem of finding collaborators to help actualize some musical vision. Whether you’re the only blues guitar player in a small town full of metalheads, or a songwriter in need of an engineer to mix your single, we hope these apps and websites will make your music that much better and your life as a musician that much more enjoyable. SoundBetter gives the average recording musician access to the same kind of resources as a major label recording artist laying down a new record. Got halfway through recording a song and realized you need some harp on it? Did your friend mix your EP, but it just doesn’t sit right? SoundBetter might just be your solution. SoundBetter is a unique platform that connects musicians with professional musicians, producers, and engineers who provide any kind of service you can imagine you may need while making your tracks. You simply submit a posting to SoundBetter outlining what you need, and you’ll get quotes from a series of professionals offering to do the job. Many of the freelancers on SoundBetter work with a 100% Satisfaction Guarantee, which means that if you don’t love the work they did on the track, there’s no commitment to keep the audio and pay them. But a user on the platform and major label pinch hitter, Brent Kolatalo, says that feedback and revision works simply and effectively on SoundBetter. He says, “My definition of a ‘bright and clear’ sounding vocal might be a bit different than yours. It usually takes maybe an extra revision or two without the artist being there, but it's worth it in the end.” This all means that SoundBetter is not only a way to find great talent, but an environment that makes working with that talent easy. It seems like all of the major DAWs that are currently on the market are set to have a foothold for life. Ableton Live is probably going to be the all–in–one production, programming, and DJ suite for those who lean towards electronic integration, while Pro Tools and Logic will remain the favorites of recording engineers. 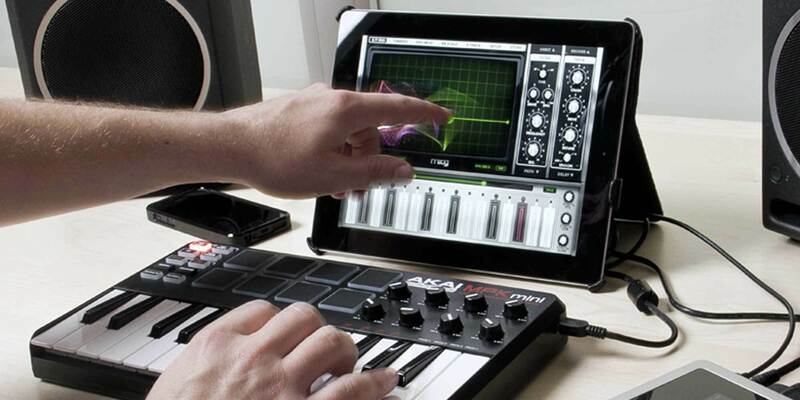 But BandLab has noticed an overlooked gap in the DAW market: mobile collaboration. 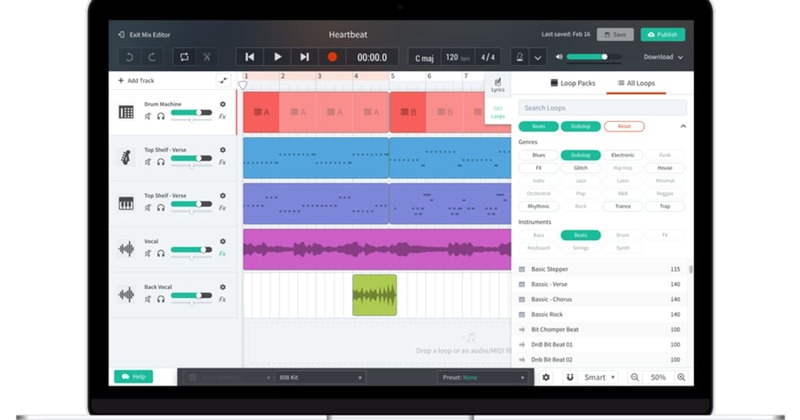 What makes this app so exciting is that it’s a cloud–based recording suite that gives collaborators all over the world access to the same mix. You can drum in Austin while your friend plays bass in Budapest. BandLab can be accessed via the web or mobile apps for iOS and Android, which means that it’s easy to record literally anywhere you are. Especially given the quality of audio interfaces that can hook up to an iPad, musicians are finally getting the ability to lay down tracks literally anywhere and still collaborate with their favorite folks, no matter where those people are. http://www.vampr.me/ is all about the simple joy of playing music with people. It’s as much a social network as it is a music app, giving you the ability to link up with a stranger who may be that great new collaborator. 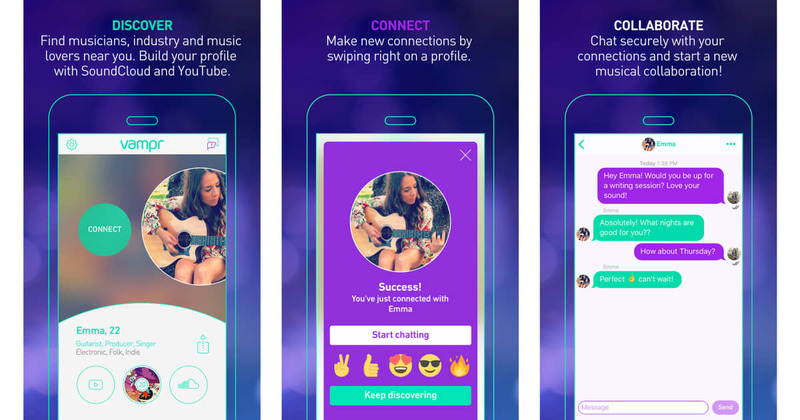 Vampr, like the similarly named Tindr, shows you a series of musicians on the app who you swipe either left or right on. If you both express interest in each other, Vampr gives you the opportunity to get in touch with each other and jam. On Vampr, you can create a profile selecting from 50 different categories for your creative talent, defining exactly what you’re looking for. That way, if you’re a jazz drummer looking for a saxophonist, a DJ looking for a photographer, or an engineer looking to work with singer–songwriters, Vampr makes that search straightforward. After you set up your profile, you can get swiping. Once you match with a potential collaborator, you can message that person through the app to talk about that collaboration and get to work right away.